I saw my first Swainson’s Warbler in eastern North Carolina, along the Roanoke River near the town of Weldon. The story is etched into my memory not for my experience with the bird, which was an obstructed view of a singing male through a mess of dense underbrush at about 100 feet, but for the effort it took to get there. I walked though woods, waded into stagnant back channels of the Roanoke, tracked through an entire field of grass to make my offer to the bird gods in the form of stinging nettle. For all of that, I was rewarded with a brief look at this often reclusive bird. Subsequent trips to lowland Swainson’s Warbler country have put me in places to hear that rich, liquid song, but I’d never had the motivation to seek out another look at one. 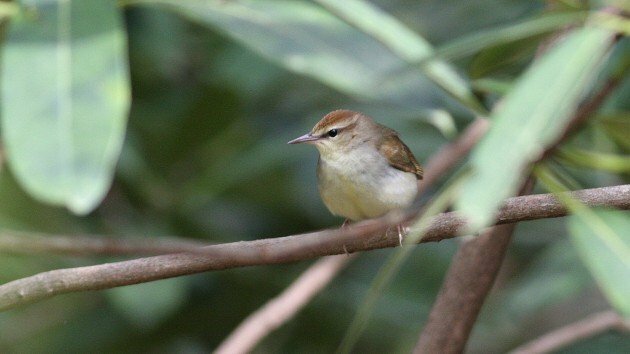 In my mind, all Swainson’s Warblers were like that first Swainson’s Warbler. Denizens of swampland and Giant Cane thickets. A bird you have to really work for, and one I probably would never really see well. Fast forward to last weekend. I had the pleasure to attend the Carolina Bird Club’s spring meeting in Hendersonville, North Carolina. I was leading a couple field trips and basically hanging around with a number of birders form the state I don’t get to see that often. A minor tangent, if you’re not a member of your state’s ornithological society, you should be. I know a lot of birders enjoy being members of the ABA or their local club, and that’s all great, but so much great work is done on the state level, most of it by volunteers. Most of all, you get info on these great seasonal meetings, at which you get to bird with local experts and birders from all over. It’s a fairly inexpensive way to scratch that traveling itch without having to shell out for more expensive professional trips. And you usually get a subscription to the quarterly journal. Anyway, I had a small group tasked with exploring part of Pisgah National Forest, a huge stretch of protected land that surrounds the Blue Ridge Parkway. One of our target species was Swainson’s Warbler. I had assumed that this mountain population, which takes to Rhododendron groves like the lowland birds take to Giant Cane, would be equally difficult to track down. I told me group about my experience with the species and prepared them for the possibility that we’d hear it but perhaps not see it. They seemed ok with this. We parked at the Pisgah Nature Center and walked a gravel road that looped around the parking lot. Warblers of other species were plentiful. We had great looks at Worm-eating Warbler, Canada Warbler, and Black-throated Green Warbler. 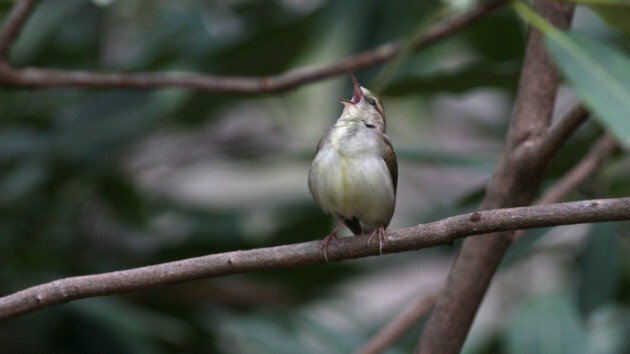 Ovenbirds were singing actively. I heard the first Swainson’s singing from a rhodo thicket just off the road. I was surprised to have it so near and considered out chances for seeing it to improve. So I played a snippet of the bird’s song on my phone. I hadn’t heard more than the first slurring notes from my phone when the thing came rocketing out of the thicket as if it had been shot from a cannon. I quickly stuck my phone in my pocket. I no longer needed it. We were presented with front row seats to the Swainson’s Warbler show, no stinging nettle offering required. We watched the bird sing for awhile, just as vociferously as it had been when hiding in the rhodo thicket. This was a bird who was confident in his choice of territory, and from my perspective he had chosen well. The thicket was at least the size of two school buses, and the bird had full run of it. After apparently being confident that the weak-voiced would-be usurper had been driven off, it dove back into the middle of its lush kingdom singing with gusto as we walked off down the trail. All told, we heard 5 more male Swainson’s, though with a look that good no one felt as though we needed to disturb them. We had other birds to see, after all. So I’m done with the Swainson’s Warblers of the lowlands. They can have their lowland forests and Giant Cane stands. They can keep their stagnant bogs and stinging nettle. From here on out, when I need to see Swainson’s Warblers, I’m going west. 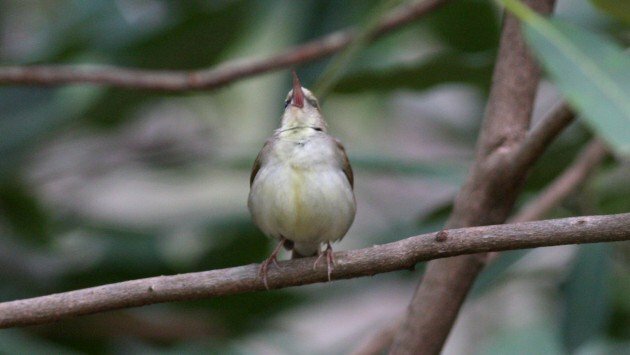 An American silly-warbler that looks like a real warbler! Aaaaargh, the only eastern warbler I haven’t encountered yet. Thanks for the pain. I agree, Jochen, though I am missing a certain denizen of Michigan as well. Those are some phenomenal photos of such a prized bird, and I’ve not seen that yellow wash happy trail down the bird’s front before. You had some Swainson’s Deliverance. I wonder how many birders you could lure to the next CBC meeting by dangling this story in front of them. A great example of what makes birding the passion of continuing surprises.